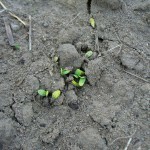 Well, apparently I have to include a lot of exclamation points in this flax growing experiment. I will cut that out. But it’s so exciting! 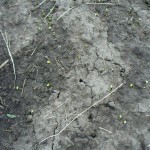 The flax began emerging on Friday April 20th. 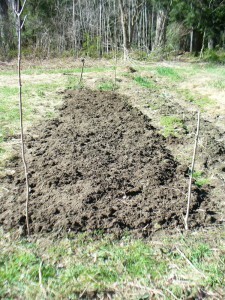 The first two to emerge were the Evelin at Amethyst Farm and the Marilyn at our community garden. 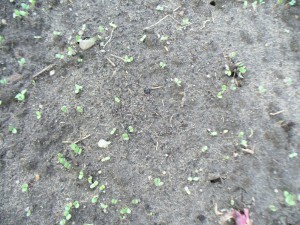 That’s five days to germinate. By the next day, Saturday April 21st, everything was up everywhere. That’s six days. Not bad. 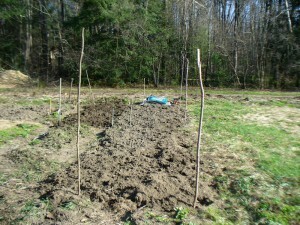 Here’s the progress as of yesterday, Tuesday April 24th (the 9th day since planting). 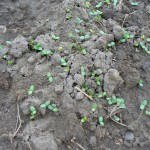 My sense is that the generic variety did not have a very good germination rate. I will try to figure out an accurate way to estimate or calculate that, but the growth of the v.n.s. 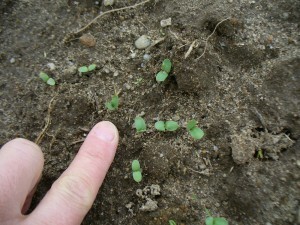 seedlings looks much more sparse than the other two. Another possibility is that the golden v.n.s. 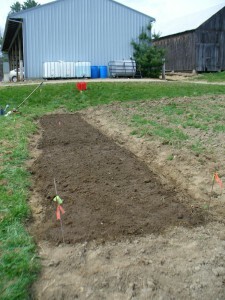 seeds on average weighed more than the brown seeded varieties, so that I actually planted fewer golden seeds even though the amount weighed the same. Maybe I should have done it by volume rather than weight. I will try to figure this out, also. Here is an overview of part of the v.n.s. 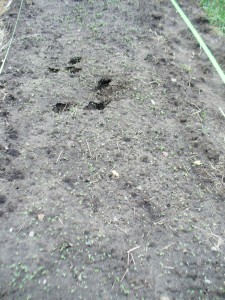 bed at Small Ones Farm, and below that, a close-up of a bald spot. 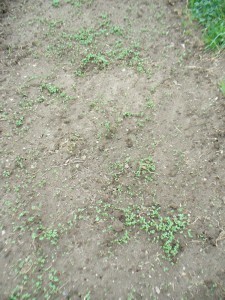 To some extent, of course, bald spots are my fault for not sowing evenly. 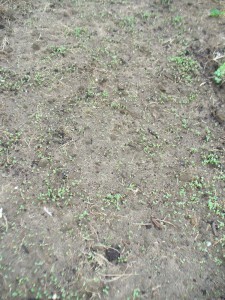 However, I think it is also because a lot of seeds just didn’t germinate. Here’s a closeup of v.n.s. 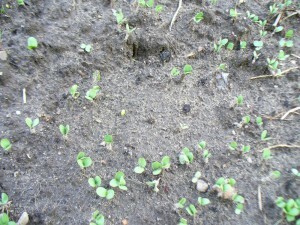 seedlings at Small Ones Farm. 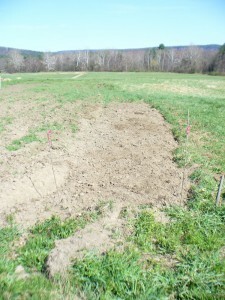 Below is an over-view of part of the Evelin bed at Small Ones Farm. 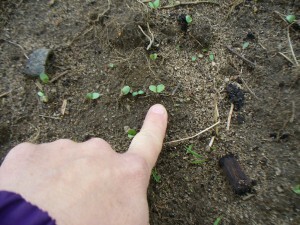 Below that, you can see there were also bald spots in the Evelin, but I don’t think they were as big. 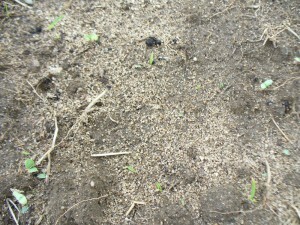 And here’s a close-up of the Evelin at Small Ones Farm. 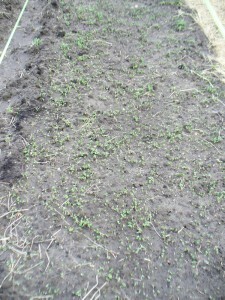 And that is the flax update. 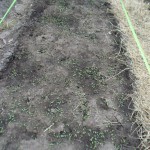 Stay tuned for future flax-growing excitement featuring visual aids such as rulers and a string grid (maybe 6 by 6 square inches) to count plant density. Woo hoo! 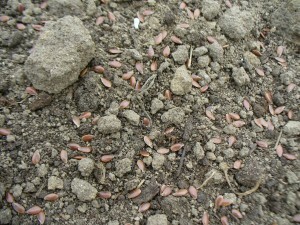 The traditional way to plant flax is by broadcasting, which means you toss it out onto the soil by hand and try to achieve an even distribution. This is what I did. 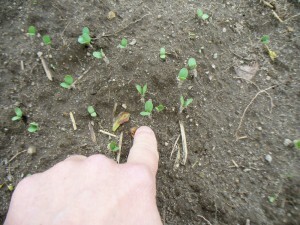 I usually sow about half of the seed as I move down the bed, and then sow the other half walking the other direction from the other side. 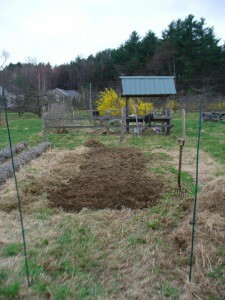 If there are big piles or bald areas, I spread them out a bit more with my hand. 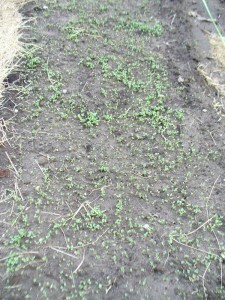 I always grow my flax in beds because I find it impossible to weed anything wider than 4 feet. 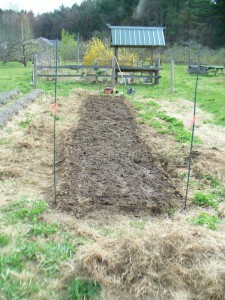 Usually I rake in the seed then press the soil down by standing on a board. 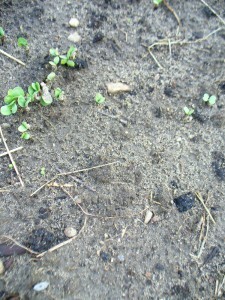 I always assumed that this buried the seeds sufficiently, and I suppose it must have because my flax has always grown just fine. 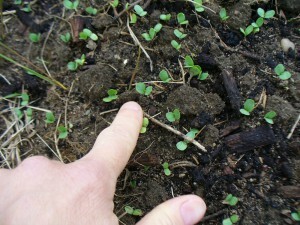 For the first time this year, though, I am growing a golden-seeded variety, which shows up clearly against the darker soil. 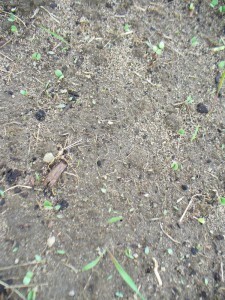 After raking, I was astonished at how much of the seed was still on the surface. 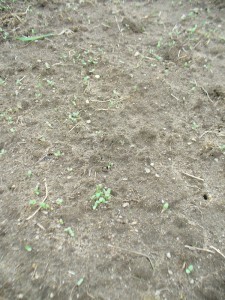 So I spread quite a lot of additional soil on top in order to cover the seeds. 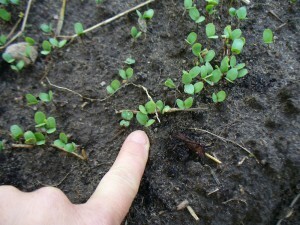 Perhaps in the past I just couldn’t see the dark-brown seeds well enough, and assumed they were buried when in fact they weren’t. This year I omitted the step of pressing down with a board. Here is a closeup of Evelin after I broadcast it. I didn’t take a separate photo of the Marilyn because it is the same color and looks the same. 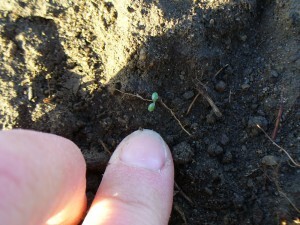 Not much contrast between the seed and the soil, right? Here’s what the non-specified variety (or v.n.s., variety not specified) looked like.The contrast makes it easy to see. 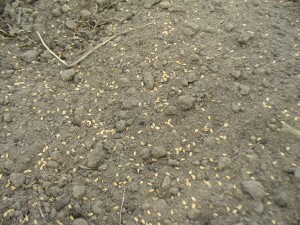 The idea is to spread the seeds fairly thickly so the plants are crowded together. This prevents them from branching, so that you get the longest possible fibers from the stems. 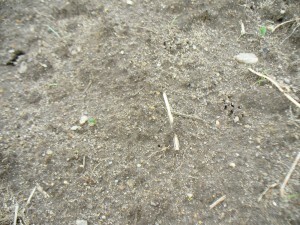 Because the weather has been so sunny and dry, the soil was very dry when I planted and it continued to be dry all week. So, I had to water, water, and water more. The need for so much water brings into question the sustainability of this crop, I realize, but hopefully future springs will be wetter. It took most of the day to do all three sites. The next day it was about 90 degrees, I kid you not. 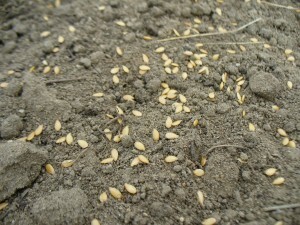 Not flax’s favorite. I had to water every day from April 15th to April 21st (yesterday). The water situation is a bit different at each place. At Small Ones there is a standpipe with a hose, on town water. 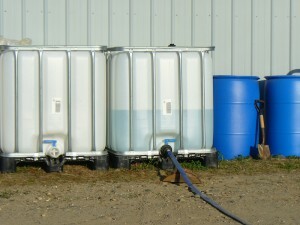 At Amethyst Farm, there’s a big container that was filled with town water, also. Eventually they want to rig up a system for collecting rain run-off from the roof of the shed, which has a big surface area as you can see in the earlier photo of the planted bed. If you compare the two photos, you can see how much the water level in the tank went down in just a few days. The clear tank offers a good visual reminder of exactly how much water I’m using. 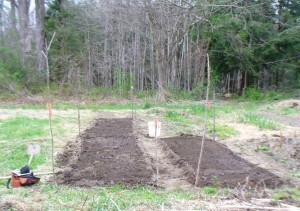 The watering situation at our community garden plot is not as convenient as the set-up which my kind hosts at Small Ones Farm and Amethyst Farm have provided (thanks again!). 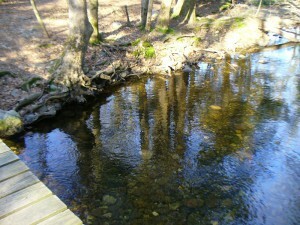 We haul water from the stream nearby, Amethyst Brook, in 5-gallon buckets. 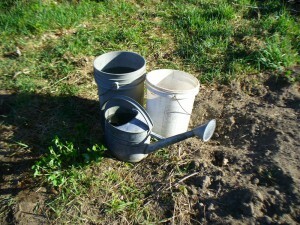 Here are the buckets and watering can, the stream, and the path from the stream to the gardens. 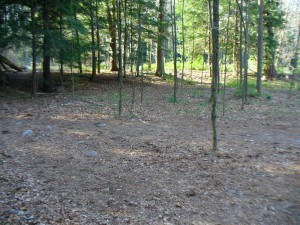 The bright green sunny spot that you see through the woods is the edge of the gardens. It is a bit of a distance, but hauling water makes a person strong, and makes me appreciate the fact that I don’t have to fetch all my water this way. The stream is right behind me in this photo. This time of year it is usually full and rushing, but due to the lack of snow and rain, it is pretty low at the moment. 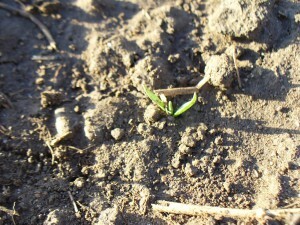 I eagerly awaited the emergence of the flax. 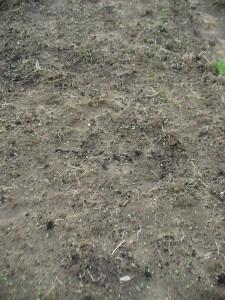 Is this flax? Not sure, probably too early. 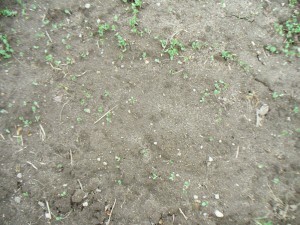 This is not flax. It looks like grass (boo). 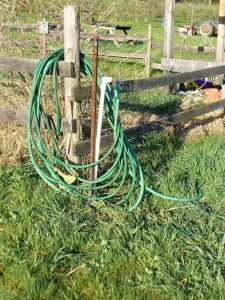 At last, on Friday the 20th while watering at Amethyst Farm, we noticed that both the Evelin and the v.n.s. were up! Whee! Evelin on the left, v.n.s. on the right (no noticeable difference in my opinion). 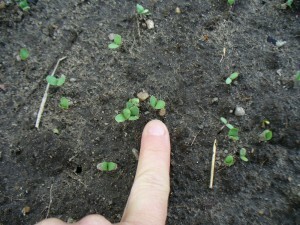 That same day, Friday the 20th, while watering at our community garden, I noticed that the Marilyn was just barely up! Nothing was up yet at Small Ones on Friday. On Saturday the 21st, both the Evelin (left) and v.n.s. 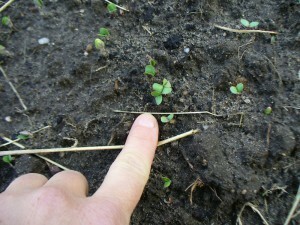 (right) were up at the community garden. And also on the 21st, both the Evelin and v.n.s. were up at Small Ones Farm but I neglected to bring my camera, alas. 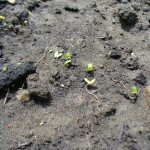 Yesterday I rejoiced in the emergence of tiny green plants. Today is Earth Day and it is raining at last. I am very grateful.